Trigeminal neuralgia is the most common facial pain syndrome and is often described as "the most terrible pain known to man". Trigeminal neuralgia is characterized by a sudden (paroxysmal) attack of facial pain described as intense, sharp, like an electric-shock, or stabbing. The pain is most commonly felt in the cheekbone, most of the nose, upper lip and upper teeth and, in some people, it also extends to the lower lip, teeth, and chin. Pain is usually felt on one side of the face (unilateral) and lasts from a few seconds to two minutes. Trigeminal neuralgia is the most frequently occurring nerve pain disorder. Trigeminal neuralgia is also called tic douloreux because there is a characteristic muscle spasm that typically accompanies a pain attack. Patients with trigeminal neuralgia report that the intermittent pain attacks and the anticipatory anxiety from not knowing when they will occur result in a significant deterioration of their quality of life and interfere with daily activities such as eating and sleeping. There are 12 pairs of nerves, called cranial nerves, which provide the nerve supply (innervate) to the right and left side of the head and neck. The trigeminal nerve is the 5th and largest of the cranial nerves and is designated as cranial nerve number V. It provides nerve sensation to the face, mouth, and the front of the scalp as well as controlling the muscles involved in chewing (mastication). The trigeminal nerve also enables us to feel sensations in the mouth and face such as taste, touch, and pain. The trigeminal nerve has three branches. The ophthalmic branch runs through the eye, forehead and nose. The maxillary branch runs through the upper teeth, gums, lips, cheek, lower eyelid and side of the nose. The mandibular branch runs through the lower teeth, gums and lip. It also controls jaw movement for mastication or chewing. Trigeminal neuralgia most often affects the maxillary branch or the mandibular branch of the trigeminal nerve. Most patients complain of pain in both the maxillary and mandibular branches. Trigeminal neuralgia is considered by the National Organization of Rare Diseases (NORD) to be a rare condition that affects approximately 1.7 million people in the U.S., although estimates vary widely. It is estimated by some studies that approximately 4-5 in 100,000 people develop trigeminal neuralgia each year in the United States. Other estimates report that approximately 14,000 people in the U.S. develop trigeminal neuralgia each year. The average age of onset is between 50 and 70 years old, though it can be seen in younger people as well. The incidence of trigeminal neuralgia gradually increases with age. Almost twice as many women are affected by trigeminal neuralgia as men. If you or a loved one has been diagnosed with trigeminal neuralgia, it's critical to learn everything you possibly can about this condition so that you can make informed decisions about your treatment. That's why we created the Medifocus Guidebook on Trigeminal Neuralgia, a comprehensive 152 page patient Guidebook that contains vital information about trigeminal neuralgia that you won't find anywhere in a single source. The underlying causes of trigeminal neuralgia. The risk factors that can increase a person's chances for developing trigeminal neuralgia. The triggers that can precipitate an acute attack of trigeminal neuralgia in many patients. The signs and symptoms associated with trigeminal neuralgia. A list of other underlying conditions that can cause severe facial pain and may be confused with trigeminal neuralgia that must be taken into consideration in the differential diagnosis of trigeminal neuralgia. How trigeminal neuralgia is diagnosed based on factors such as signs/symptoms, patient history, physical examination, dental examination, and imaging studies. Treating the underlying cause of trigeminal neuralgia in cases where an underlying cause has been identified. Enabling the patient to function and lead a reasonably good quality of life. The major types of medications that are commonly prescribed to relieve pain in patients with trigeminal neuralgia including anticonvulsants, antidepressants, and muscle relaxants. The common side-effects of specific medications that are used for pain relief. The role of nerve blocks with drugs such as local anesthetics or ethanol in the management of trigeminal neuralgia. The risks, benefits, and complications associated with the various surgical approaches for the treatment of trigeminal neuralgia. A detailed discussion of a novel, non-surgical treatment option called stereotactic radiosurgery (Gamma Knife) that has recently become available and has been shown to be effective for the treatment of trigeminal neuralgia in many patients. The role of complementary and alternative therapies in the management of trigeminal neuralgia. Quality of life issues that often confront people who suffer with trigeminal neuralgia including tips and suggestions for how to minimize their impact and better cope with the condition. Important questions to ask your doctor about trigeminal neuralgia. A Guide to Recent Medical Literature on Trigeminal Neuralgia - This section of the Guidebook contains an extensive bibliography of over 100 references to recently published articles about Trigeminal Neuralgia in authoritative, peer-reviewed medical journals with links to the absracts (summaries) of the articles. These articles represent the latest advances in the field and focus on cutting-edge research, new developments, and the lessons learned from recently published clinical trials involving patients with Trigeminal Neuralgia. This is the same level of that is used by doctors who treat people with Trigeminal Neuralgia to keep abreast of the latest developments and breakthroughs in this specialized field of medicine. Centers of Research for Trigeminal Neuralgia - We've compiled a unique directory of doctors, hospitals, medical centers, and research institutions with special interest and, in many cases, clinical expertise in managing people with Trigeminal Neuralgia. The "Centers of Research" directory is a valuable resource for quickly identifying and locating leading medical authorities and medical institutions both within the United States and other countries who are considered to be at the forefront in clinical research and treatment of Trigeminal Neuralgia. You'd have to spend days - or even weeks - attempting to compile your own list of doctors and medical centers but, with the "Centers of Research" directory, the information is already right at your fingertips. All you have to do is act on the information by selecting and contacting the experts or medical institutions listed in the directory by state and country. Organizations and Support Groups for Trigeminal Neuralgia - The Guidebook also includes a directory of organizations and support groups whose goal is to help people with Trigeminal Neuralgia by providing access to information, resources, and services. Many of these organizations can answer your specific questions, enable you to "network" with other patients, and provide guidance in areas such as financial, social, or medical-legal issues. This valuable directory of organizations and support groups includes complete contact information, including phone numbers and E-mail addresses. 20% Discount - For a limited time, you can purchase the Medifocus Guidebook on Trigeminal Neuralgia at a special 20% discount off the regular list price. Your 20% discount will automatically be applied when you go to "Checkout". Order Your Copy of the Medifocus Guidebook on Trigeminal Neuralgia Today! The Medifocus Guidebook on Trigeminal Neuralgia is available in the following two convenient formats: Printed and Digital. "My 19 year old daughter is suffering from Trigeminal Neuralgia. The TN Guidebook was very informative - especially in pinpointing the symptoms and giving us resources on where to go for additional information and help from doctors. Thanks for putting all this information in one place and making it easy to read and use." "I spent numerous hours in the library and on the Internet looking for information on trigeminal neuralgia. The MediFocus Guidebook on Trigeminal Neuralgia I purchased was the BEST and most detailed of the all the information I could find. I have referred to the Guidebook many times...thank you for offering it." 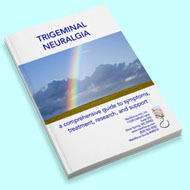 "The MediFocus Guidebook on Trigeminal Neuralgia was very helpful and full of legitimate resources. The Guidebook described the various approaches to treatment in a detailed but very readable manner. It has provided me with the ammunition I needed to engage my doctor in a detailed discussion about my treatment options."